Not sure what to make for dinner tonight? 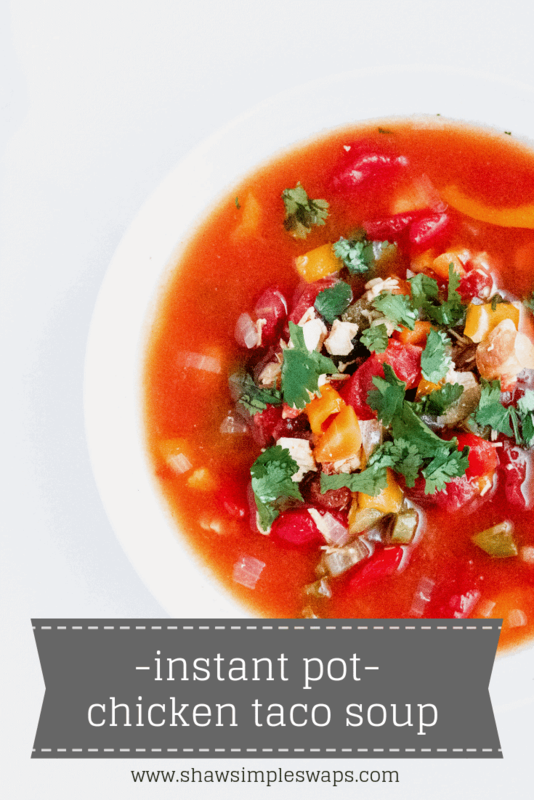 Problem solved, this Chicken Taco Soup made in the Instant Pot is your answer! Recently I announced so big news, I AM THE WORST FOOD BLOGGER EVER! Seriously though, I’ve been blogging 5 years, FIVE YEARS, and I still haven’t quite figured out how to put an Ad Network on here or navigate the world of SEO as well as I should. I mean really, why am I just now posting my first Instant Pot recipe when it’s been trending for years! But, then I remembered something VERY important about this little space I have on the world wide web, it’s entirely my own. I get to decide (with your input of course!) if I’m making a cookie recipe in January or finally pulling out my Instant Pot to bring you the best Chicken Taco Soup ever! 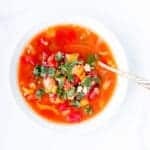 I’m going to promise you 2019 will be filled with fresh ideas that highlight the beauty of nutritious and delicious meals made in no time flat, like this Chicken Taco Soup in the Instant Pot! Or, heck, you can whip up the infamous Sweet Potato Chili too if you’re jonsing for more cold weather fare! Oh, and I also promise I’ll keep my tiny human alive, that’s a full time job in itself! 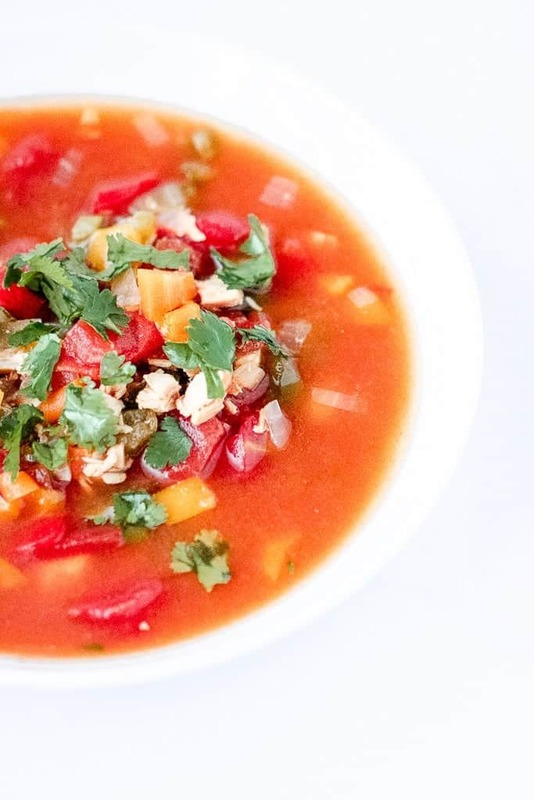 Chicken Taco Soup - The perfect comfort classic with a healthier twist! 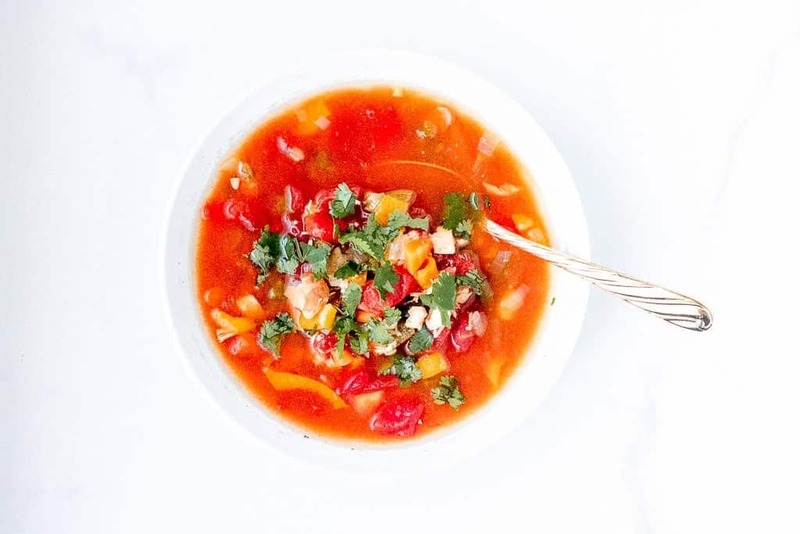 Broth based with loads of tomatoes, carrots and taco seasoning! Whole 30 and Paleo Compliant. Turn on Instant Pot and set to soup setting and adjust time to read 10 minutes. Add chicken broth, diced tomatoes, water, chicken breasts, red onion, carrots, bell peppers, jalapeño, taco seasoning and black pepper, stir. Secure and close Instant Pot lid, setting the pressure level to set to LOW. Allow to warm up (Instant Pot will read OK during this cycle). Instant Pot will automatically start cooking cycle for 10 minutes when pressure has built up. When finished, carefully release steam valve with the quick release function. Be cautious of your hands not to burn them on the steam! Stir soup, portion into bowls and top with cilantro and optional Greek yogurt and cheese. For more complex carbs, serve with whole grain tortillas! Now tell me, what do you promise to rock in 2019!? Any new goals? I want to know! « The Best Sugar Cookie Recipe – Holiday Cutouts + Just for Fun!